The three bots reviewed in this entry all carry out essentially the same technique– they create a tweet based on the juxtaposition of material from two different sources– yet produce output that feels quite different. The reasons for this are partly thematic, partly due to the data source, and partly because of the way the join the juxtaposed elements. An important early bot that uses this technique is Ranjit Bhatnagar’s @Pentametron, which retweets iambic pentameter tweets joined by end rhyme and creating surprisingly cohesive and occasionally humorous couplets. Juxtaposition is also a poetic technique that became prominent with Modernism and is a central strategy in Ezra Pound’s poetry and poetics. This entry will analyze “Two Headlines” by Darius Kazemi, “Dreams, juxtaposed” by Allison Parrish, and “And Now Imagine” by Ivy Baumgarten. This bot harvests news headlines and produces hourly mash-ups that read like a single, absurdly funny headline. Kazemi uses the bot’s description to frame it as a kind of joke bot, “Comedy is when you take two headlines about different things and then confuse them,” and he’s right because the results are often hilarious. But beyond the surprisingly effective comedic value that arises from clashing frames of reference, there’s a tiny subversion at work here. As discussed in the entry on “The Answer is No,” news headlines are carefully crafted bits of compressed language, hopefully about important things that are worthy of a reader’s attention. Headlines also enjoy a privileged formatting in the design of websites and print publications and are meant to be read as a unit, and followed by their articles, which elaborate upon them. To join two headlines with punctuation or a conjunction subverts their purpose and poetic strategies (alliteration, rhyme, rhythm, compression, figurative language, conceptual framing, etc.) and leaves them oddly exposed. And by automating the process algorithmically, it acts like an inverted cut-up. 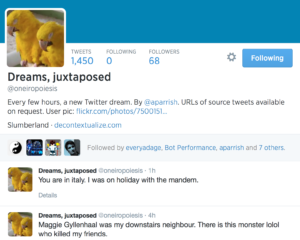 This bot harvests tweets about dreams (I presume) and juxtaposes them to produce “a new Twitter dream,” published every 3 hours. Because they’re framed as dreams and the data source is related to dreams, the results are often surreal, in the common sense of the term and in the artistic sense as well. Joining snippets of text from different sources, the constructive stage of the cut-up technique, produces language combinations that aren’t governed by logic, which is why Dadaists and Surrealists developed the technique. The use of dream content aligns it even more closely with these artistic movements, because they sought to tap into the unconscious mind to access a higher reality in their art. But dreams also tap into conscious and unconscious desires, which when combined with another person’s dreams, can either combine or clash to produce a unique expression of our zeitgeist. I bought a owl that looked like a wolf. I was dating 50 cent, and then I smoked in my nap. This bot takes the same concept discussed above– searching, in this case, for tweets that begin with the word “imagine”– but by joining them with the word “now” she transforms the relation between the juxtaposed sentences. The first sentence sets an image in the readers’ mind, which becomes the point of departure for the second image. We understand the second image in relation to the first, in a move that is simply additive (image + image) but is rhetorically stochastic. The layering of images, one upon the other, creates an effect well known and explored by Imagist poets such as William Carlos Williams, Ezra Pound, H.D. and Amy Lowell. Read “The Red Wheelbarrow” for a masterful example of layering, with each stanza modifying the overall image in our minds. The randomness of the juxtaposed images Baumgarten’s bot don’t always work well together, but they are delightfully surprising to readers willing to play along with the imagination game it presents. Imagine how these three botteurs distill poetic strategies from the early 20th century into algorithms and create bots to relentlessly explore them. 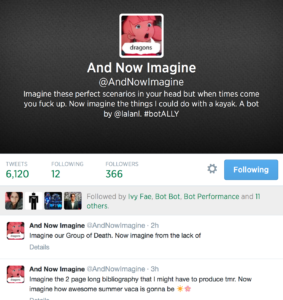 Now imagine yourself following these bots into uncharted poetic spaces.